To make the dressing, place the peanut butter, soy sauce, rice vinegar, chili-garlic sauce, brown sugar, ginger, red pepper flakes, and 3 tablespoons of chicken broth together in a blender or bowl of a food processor. Blend until smooth. Season to taste with salt and pepper. Thin the dressing to your taste by adding more chicken broth or water. Bring a large pot of lightly salted water to a boil. Add the linguine and cook until al dente, 8 to 10 minutes. Drain and place pasta into a large mixing bowl. Add the chicken, carrots, green onions, red pepper, celery, and cilantro to the bowl with the linguine. 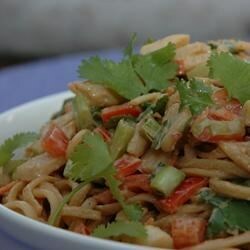 Pour the dressing over the noodle-chicken mixture and toss until mixture is evenly coated. Divide the salad among eight serving plates, and sprinkle peanuts over each serving. This recipe is delicious. As many others have mentioned, it is important to double the dressing. If you didn't double the dressing it would be too dry. O-M-G This is the most awesome sauce!! I made it just like the recipe the first time and now I make the sauce and keep it in the fridge to slather on everything. It is addictive! !